How did this name go from presidential stalwart to furry and blue? 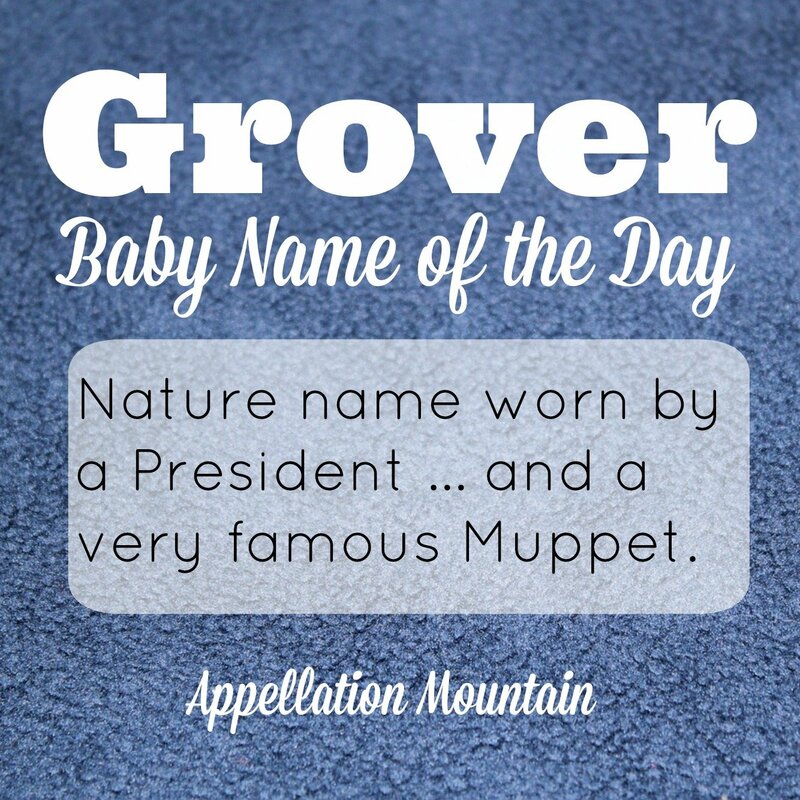 Our Out-There Baby Name of the Day is Grover. Back in 1837, Richard and Ann Cleveland welcomed their fifth child. They named him Stephen Grover in honor of the very first pastor of First Presbyterian Church of Caldwell, New Jersey. Dad was serving as the second pastor of that church at the time of his son’s birth. By the time he reached adulthood, Stephen had shed his commonplace given name for his less familiar middle, and embarked on a political career. In 1884, the year Cleveland was elected President of the United States, Grover skyrocketed to #20. And yet Grover wasn’t completely unheard of pre-president. 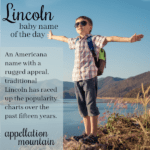 The name ranked in the US Top 500 in 1880, and would remain there through the 1950s. Drop the ‘r’ and maybe you’ll see this name in a different light. It comes from the Old English graf – grove of trees. Or maybe it’s an occupational name for a ditch digger, or a place name for someone who lived in a hollow. But let’s stick with the arboreal meaning, shall we? It puts Grover in the company of names like Forrest and Rowan. Of course, Sesame Street’s Grover Monster is almost everybody’s first thought. He calls himself “lovable, cute and furry” and he’s been with the venerable children’s show since early days, though Grover as we know him now didn’t officially appear until the show’s second season. This means that anyone who grew up from the 1970s onwards – in other words, anyone having a baby today, has Grover filed next to Kermit and Beaker as Muppet names, not potential names for a child. 2002 bestselling novel The Nanny Diaries put young college graduate Annie in charge of four year old Grayer. In 2007, it became a movie with a young Scarlett Johansson as the nanny. Her charge was called Grayer, but Annie nicknamed him Grover. 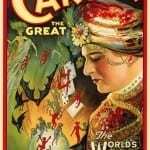 If you think about the names of the other privileged children in the story, Grayer was pitch perfect – and Grover wasn’t so far off: Darwin and Tinford, Lulu and Cristabelle. Grover: Cautiously Ready for a Comeback? Here’s the thing about Muppet names: when they were chosen in the 1970s, they were the names of senior citizens. In 1910, Grover ranked #221. Kermit, #193. And Elmo was a respectable #263. No one in Sesame Street’s target audience answered to those names, but their grandparents? Possibly. So if Everett and Chester feel like edgy, cool up-and-comers, it seems likely that other names from that generation could follow. Another point in his favor? The successful Percy Jackson series includes a character called Grover Underwood. The same generation of kids who know Grover as blue and furry also know him as a heroic creature from myth. So that’s a plus. 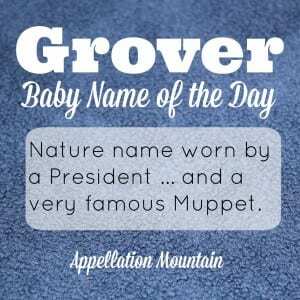 It would take a daring namer indeed to consider Grover, and yet chances are that this name would wear very well in 2015. Caitlin, what a great name! So glad to hear it wears well. We welcomed babies Grover and Beatrix on June 9, 2015. Congratulations, Matt – what a great set of twin names! I love the sound of Grover, but I don’t think I could ever actually use it. More power to the brave ones who do though, I think it’s really cool. We named our baby Grover a couple of years ago. We get some horrified responses from my parents’ generation, but mostly people think it’s cute, and we love it. No regrets. Personally, I think it’s going to be very trendy in 5-10 years. Thanks for commenting, Samantha – delighted to hear that Grover wears well! I remember reading The Nanny Diaries and thinking that it made a great name. I love Grover! We’re planning on using it, at the very least as a middle name. My husband’s relative wore the name so handsomely that the muppet association barely phases me! Kids may know it for that reason, but the character seems to be much less of a phenomenon than Elmo. I love Grover! He was my favorite Muppet, so it’s far from a bad association for me. I named my dog Grover and always get compliments on what a cute name it is. Grover is not a name I ever considered when I was naming my kids, but now I kind of love it. I think it would be adorable on a little boy and hopefully beyond! The muppet is my first thought and he is a bit ditsy, but a child would probably really enjoy the association. (Although my own George seems to dislike Curious George, so maybe not!) On the subject of muppet names, we did consider Oscar and wondered it the Grouch would be a problem. Although Oscar has many more non-muppet associations. Moreso than Grover. I like how it’s unusual and uncommon , yet familiar and easy to spell. And the tree association is lovely. Perhaps if you like Oliver, but it’s too popular, you could go with Grover. Maybe that’s why I like the name, since we almost used Oliver. I really like Grover! And seeing as Grover is probably my favorite Muppet, I don’t see the connection as a negative. I’d love to see some little Grovers running around.